77 Marlborough is located on the north side of Marlborough, between Berkeley and Clarendon, with 75 Marlborough to the east and 79 Marlborough to the west. 77 Marlborough was built ca. 1864 for shipping merchant and real estate investor John Lowell Gardner, one of nine contiguous houses (71-73-75-77-79-81-83-85-87 Marlborough) he had built as rental property. He and his wife, Catharine Elizabeth (Peabody) Gardner, lived at 7 Beacon and then at 182 Beacon. 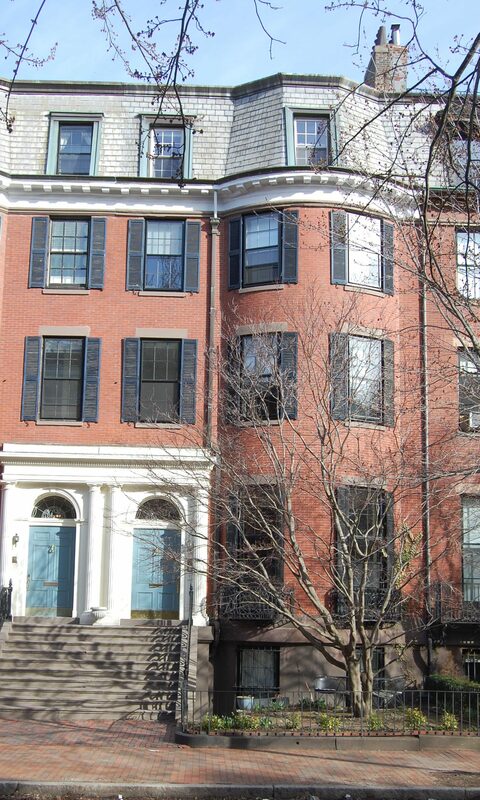 Click here for an index to the deeds for 77 Marlborough. By 1864, 77 Marlborough was the home of Jacob Crowninshield Rogers and his wife, Elizabeth (Peabody) Rogers. They previously had lived in Salem. He was a merchandise broker and agent for the North Bedford Copper Company and later would become agent for the banking firm of J. S. Morgan & Co. of London. The Rogerses continued to live at 77 Marlborough until about 1868, when they moved 89 Marlborough. By 1870, 77 Marlborough was the home of Rev. Alexander Hamilton Vinton and his wife, Elizabeth (Stockbridge) Vinton. They probably moved there in 1869, when he became rector of Emmanuel Church. They previously had lived in New York City, where he was rector of St. Mark’s Church. They continued to live at 77 Marlborough during the 1877-1878 winter season, after which they made their permanent home in Pomfret, Connecticut, where they had maintained a second home for many years. 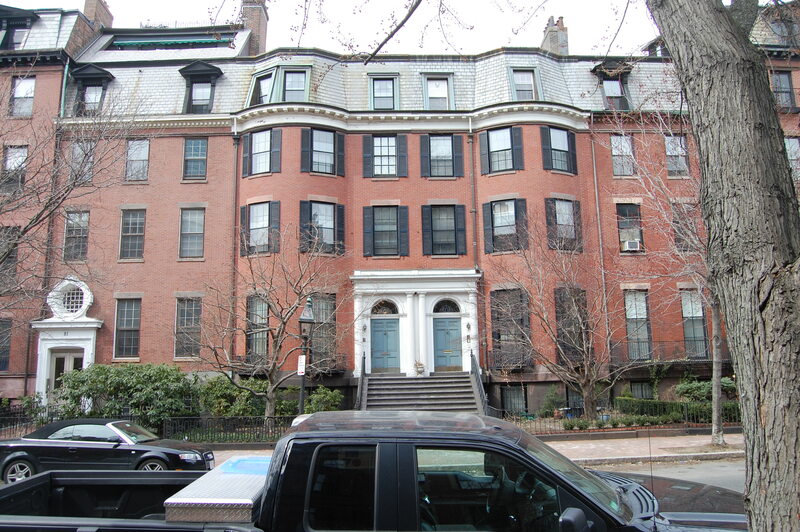 77 Marlborough was not listed in the 1879 Blue Book. By the 1879-1880 winter season, it was the home of Dr. Thomas Morgan Rotch, a pediatrician and professor, and his wife, Helen (Rotch) Rotch. They previously had lived at 121 Boylston. They continued to live at 77 Marlborough during the 1881-1882 season, after which they moved to a new home they had built at 197 Commonwealth. By the 1882-1883 winter season, 77 Marlborough was the home of banker and broker Arthur Lithgow Devens, Jr. and his wife Agnes Russell (Elwood) Devens. They previously had lived at 279 Clarendon. They continued to live at 77 Marlborough during the 1883-1884 season, after which they lived at 18 West Cedar and then, by the 1886-1887 season, moved to a new home they had built at 367 Beacon. During the 1884-1885 winter season, 77 Marlborough was the home of Dr. James Jackson Minot, a physician specializing in diseases of the lungs, and his wife, Elizabeth (Whitney) Minot. They had married in October of 1884 and lived at 77 Marlborough while their house at 188 Marlborough was being built. They had moved to 188 Marlborough by the 1885-1886 season. By the 1885-1886 winter season, 77 Marlborough was the home of cotton broker and manufacturer Charles Bean Amory and his wife, Lillie (Clapp) Amory. They continued to live there during the 1887-1888 season, but had moved to 209 Beacon by the next season. By the 1888-1889 winter season, 77 Marlborough was the home of Rev. Roland Cotton Smith and his wife, Margaret Sigourney (Otis) Smith. In that year, he became assistant minister at Trinity Church; he previously had been rector of St. John’s Episcopal Church in Beverly. The Smiths remained at 77 Marlborough until about 1892. In 1893, he was named rector of St. John’s Church in Northampton (and in 1902, he became rector of St. John’s Church in Washington DC, where he remained until 1922). By the 1892-1893 winter season, 77 Marlborough was the home of coal dealer Frederic Parker and his wife, Mary (McBurney) Parker. They previously had lived at 1 Spruce. They continued to live at 77 Marlborough in 1894, but had moved to Bedford in 1895. During the 1894-1895 winter season, it was the home of Miss Charlotte Henderson Guild. She probably had previously lived at 80 Beacon with her mother, Elizabeth Henderson (Rice) Guild, the widow of Samuel Eliot Guild. Elizabeth Guild had died in June of 1894. Charlotte Guild moved from 77 Marlborough by the next season and by 1897 was living at 251 Beacon, which she had purchased in March of 1894 but was leased to others. 77 Marlborough was not listed in the 1896 Blue Book. By the 1896-1897 winter season, it was the home of attorney Emor Herbert Harding and his wife, Helen Beal (Hall) Harding. They previously had lived in Milton. They continued to live at 77 Marlborough in 1900, after which they moved to 155 Bay State Road. 77 Marlborough was not listed in the 1901 Blue Book. By the 1901-1902 winter season, it was the home of attorney Robert Hallowell Gardiner and his wife, Alice (Bangs) Gardiner. They previously had lived in Chestnut Hill. They continued to live at 77 Marlborough during the 1907-1908 season, but moved thereafter to 322 Beacon. On March 29, 1907, 77 Marlborough was acquired from the trustees under John L. Gardner’s will by attorney Julian Codman. 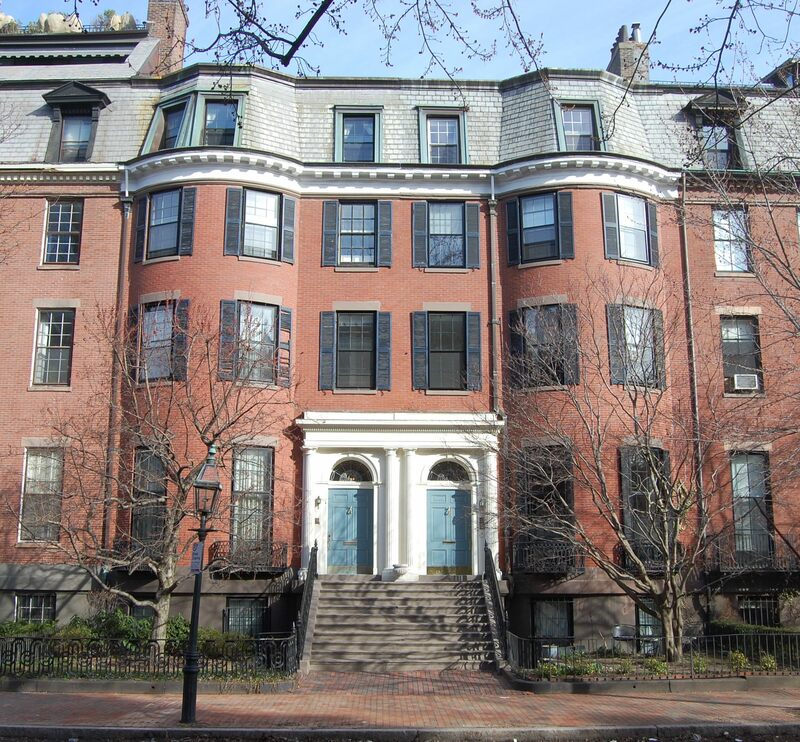 He and his wife, Norah (Chadwick) Codman, lived at 270 Clarendon. 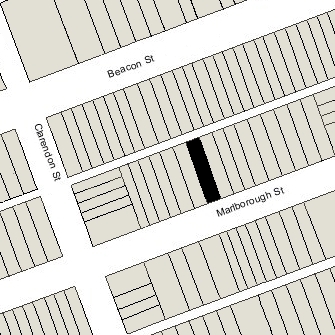 They apparently decided not to occupy 77 Marlborough and moved, instead, to an apartment at 409 Marlborough. On October 24, 1907, 77 Marlborough was acquired from Julian Codman by attorney Richard S. Dow. He and his wife, Abbie (Rawson) Dow, made it their home. They previously had lived at 18 Marlborough. They also maintained a home in Marion. An October 27, 1907, Boston Globe article reporting on the purchase indicated that they bought the property as their home and “will make improvements after the termination of the existing lease a few months hence.” Presumably, the lessees were Robert and Alice Gardiner. The Dows continued to live at 77 Marlborough in 1913, but moved temporarily in about 1914 to Marion. During the 1913-1914 and 1914-1915 winter season, 77 Marlborough was the home of Howard Elliott — president of the New York, New Haven and Hartford Railroad — and his wife, Janet (January) Elliott. They moved thereafter to 193 Marlborough. By the 1915-1916 winter season, the Dows were once again living at 77 Marlborough. They continued to live there during the 1917-1918 season, but moved thereafter and, by 1920, were living in an apartment at 52 Hereford. On May 18, 1918, 77 Marlborough was purchased from Richard Dow by Elizabeth Bethune (Higginson) Jackson, the wife of Charles Cabot Jackson, Jr. They previously had lived at 34 West Cedar. They also maintained a home in Dover, Massachusetts. Charles Jackson was a former stockbroker, having been associated with his father’s firm, Jackson & Curtis. He had retired in 1917. During the 1925-1926 winter season, the Jacksons were traveling in Europe and 77 Marlborough was the home of investment banker John Eliot Thayer, Jr., and his wife, Katherine Lee Bayard (Warren) Thayer. They had lived at 103 Beacon during the previous season. They also maintained a home in Lancaster. 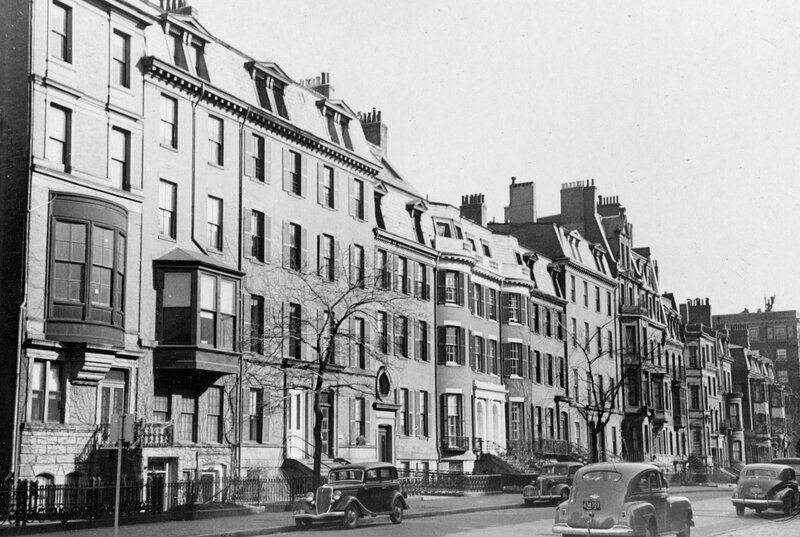 By the 1926-1927 season, they had moved to 33 Marlborough and the Jacksons had resumed living at 77 Marlborough. 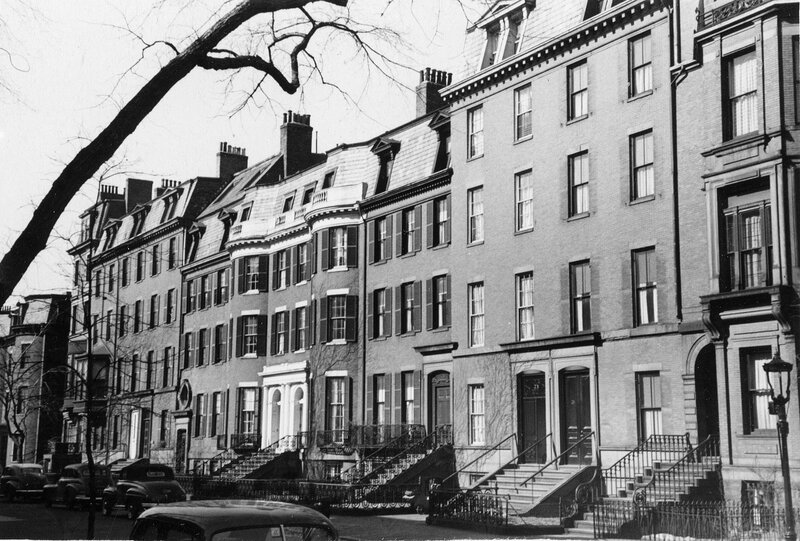 The Jacksons continued to live at 77 Marlborough until about 1965, when they made Dover their year-round residence. On August 3, 1966, 77 Marlborough was purchased from Elizabeth Jackson by Harvey Brockway Moore and his business partner, Donald W. Scott. That same month, they filed for (and subsequently received) permission to convert it from a single-family dwelling into five apartments. On November 23, 1966, they transferred the property to Harvey Moore and his wife, Elizabeth Jackson (Blakney) Moore. They lived at 31 Lime. He was a life insurance agent. The property changed hands and on June 17, 1983, was purchased by John Robert Tedeman and his wife, Karen Deborah (Shackford) Tedeman. In August of 1983, they applied for (and subsequently received) permission to reduce the number of units from five to four. 77 Marlborough remained an apartment building, assessed as a four- to six-family dwelling, in 2015.